Stephanie contacted me a few months ago to take photos of her husband for some professional headshots, Upon photographing him I noticed in their home some gorgeous images of their children throughout the years on the walls. She had mentioned to me that she wanted to get some updated photos of the kids. 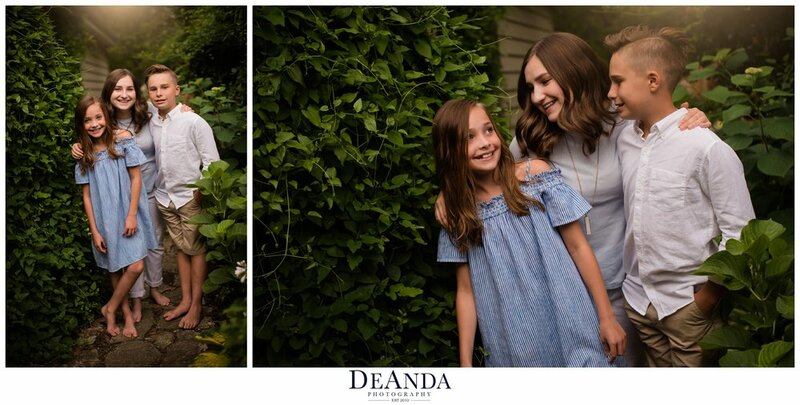 Stephanie contacted me just a few days later so we could plan a session at their home in Arlington Heights before their move to the east coast at the end of July. They had the most amazing swing in a huge tree in their front yard that the kids loved that we captured, along with a great garden area. With all the rain we had,many of the flowers in her yard were in full bloom which was pretty much perfect for our session. Even though we had cloudy skies in the forecast we lucked out towards the end of our session while the sun peeked through the clouds. Enjoy some of the highlights from their session bellow.